This question can be solved by TESTing VALUES. We're asked for the value of X. This ratio gives us a 'relationship' between X and Y, but does not tell us what either variable is. We know that X MUST be a multiple of 3 and Y MUST be an equivalent multiple of 11, but we don't have the actual numbers. X = 3, Y = 11.... this fits the ratio 3:11 and the LCM is 33 (which is the value of 3Y). X = 6, Y = 22.... this ratio (6:22) reduces to 3:11 and the LCM is 66 (which is the value of 3Y). As an aside, what is the source of this question? Originally posted by EMPOWERgmatRichC on 04 Sep 2015, 10:26. Last edited by EMPOWERgmatRichC on 07 Apr 2019, 12:50, edited 1 time in total. Per statement 1, x/y = 3/11 ---> x= 3k, y =11k, k \(\in\)integer. Thus this statement is not sufficient. Per statement 2, LCM (x,y) = 3y ---> different sets possible, (x,y)=(6,2), (3,1) etc. Thus this statement is not sufficient. Case 1: when k \(\neq\)3 or 11 ---> LCM (x,y) = LCM (3k, 11k) = 3*11*k = 33k =3y and this is true for ALL k. You will have many different values thus mkaing both statements NOT sufficient, but if you still want to proceed ahead, look below for the 2nd case. Case 2:when k = 3 or 11, LCM (x,y) = \(3^2\)*11 or 3*\(11^2\) (in the simplest of terms). Thus you get 2 different possible values for different values of k, making E as the correct answer. Heey, this is how i solved the question. x:y = 3:11 implies that x= 3k and y= 11k, hence x can be anything as it depends on the parameter k. So clearly statement 1 is insufficient. We know that X*Y = LCM(x,y) * GCD(x,y) . by using this fact, we can interpret the S2 as follow: X*Y = 3*Y*GCD(X,Y), which after elimination becomes X= 3*GCD(X,Y). Here again we have no idea about the value of GCD(X,Y) so statement 2 is clearly insufficient. Now, if we take the two statements together, we can deduct that GCD(X,Y) = K, but does it add any valuable information or input? of course not ! the whole information embedded in one equation can be written as : X= 3 GCD(X,Y)= 3k... so the correct answer is (E). What if x = 3 and y = 11? Statement (1) is clearly insufficient. For statement (2), LCM of x and y is 3y. x=3 and x=3y both satisfy this constraint. Using both (1) and (2) also we don't get any more usable information. we are given only absolute value. this is not sufficient to get a definite value for x. since multiple options are possible, the answer should be E.
why am I getting this ? If you consider Fact 2 by itself, then X COULD equal 3Y... meaning that X > Y. However, when you include the ratio in Fact 1, we know that X < Y... so X = 3Y is NOT a possibility. We now have two different possible values for X, so the final answer is INSUFFICIENT. ok so now since 3y is not a possibility , are we left with only x=3 ? I think that the general error in your thinking has to do with the information in Fact 2: "The least common multiple of X and Y equals three times the value of Y." This does NOT necessarily mean that X = 3Y. Since we're dealing with the LCM of a pair of integers, it's quite likely that the LCM is GREATER than both X and Y - but your work implies that the LCM is equal to X. 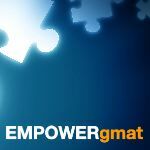 When dealing with Quant questions on the GMAT, if you're ever unsure about a math rule or whether you're properly interpreting a math pattern or not, the easiest way to prove if your thinking is correct is to come up with a couple of examples and see if they confirm that your idea is correct. In that way, TESTing VALUES can be useful on MOST Quant questions. and that's correct in case y is a prime , but we don't know that, here's my mistake , right ? Yes - I think that properly explains the mistake. Combined, we have evidence that X can be at least 2 different outcomes (3 or 6). Hi Rich I do not know how the examples of statement 2 fulfill statement after you combine both statements. In both examples, the ration is NOT 3/11. Thus, X=3 and X=6 are both possible solutions and the final answer is INSUFFICIENT. Thanks a lot for you reply. Actually, I did the work as you suggest. Because you are neat and organized. I thought it might be helpful for other student to see the solution complete to avoid confusion for them. Again thank for your effort.